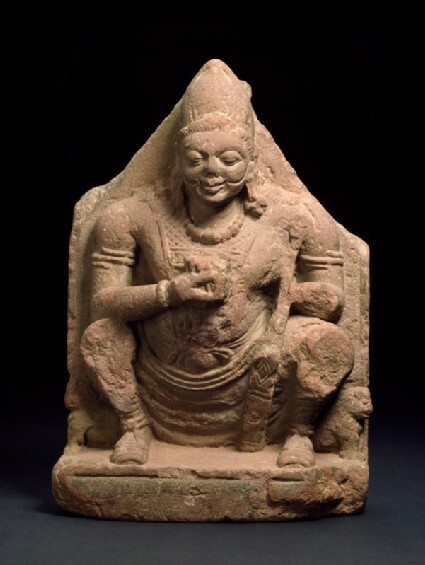 Surya is shown in the costume of a Kushan ruler, with boots, tunic and cap. The udīcya (northern) costume, featuring boots, a sort of tunic and a soft cap, its point tilted forward, first appears in Gandhara and Mathura around the first century of our era in depictions of the foreign people to whom the Kuṣāṇa rulers belonged. The squatting position makes a similar appearance at Mathura at this time, adopted by images of Sūrya, Hārītī [see EA1971.36] and some little figures of mother-goddesses (mātṛkās). The figure holds a small bowl (?) topped by a lotus blossom in his right hand; his left probably held a sword, of which only the bottom of the scabbard remains. Two little sitting lions, in profile on either side, recall the lion throne of some Kuṣāṇa princes or kings, whereas Sūrya is associated with the seven horses who draw his chariot, thus raising the question, as to whether some other images of the period, as to whether or not this is the Sun-god. Later, Sūrya is unmistakably identified by the presence of two attendants. The sculpture is notable for its detail and the crispness of the carving. Whether the deeply cut lines around the sides and lower parts of the face outline a beard (some Kuṣāṇa kings are shown bearded on their coinage) or a faceguard, it is difficult to say.